Cell is the ultimate creation of Dr. Gero. Cell was created from the DNA of the greatest fighters in the world such as Goku, Piccolo, Vegeta, and Freezer. Cell came from another Mirai timeline. Cell cannot become complete unless he absorbs Andriods 17 and 18. Mirai Trunks had already killed the Androids in that time, so Cell killed Mirai Trunks and stole his time machine. Cell then had to regress into his larva form to fit in the time machine, but he made it to the past. It took Cell 4 years to return to his normal form. When he was normal again, he absorbed people through his tail so he could gain extra power. Cell is discovered by Piccolo who had just fused with Kami. Piccolo manages to trick Cell into explaining Cell's past. Cell explains this but Piccolo is ready to fight him again. Mirai Trunks and Krillin show up and Cell makes a run for it. Cell absorbs alot of people and finally reaches Android 17. 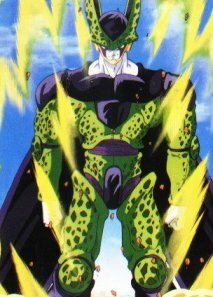 Cell aborbs him and reaches his 2nd form. Cell now wants to absorb Android 18. Before he gets the chance Vegeta and Mirai Trunks show up. Vegeta fights Cell and wins. But Cell tricks Vegeta into letting him absorb Android 18 so Vegeta would have a better challenge. Vegeta agrees to this. Mirai Trunks and Krillin try to stop Cell, but Cell manages to absorb Android 18. Cell now reaches his Perfect form. Perfect Cell defeats Krillin and Vegeta. Mirai Trunks challenges Cell, but Mirai Trunks surrenders when he knows he can't win. Cell then decides to hold a tournament in about 8 or 10 days. He calls it the "Cell Games". Once the Cell games arrive, Cell effortlessly defeats Mr. Satan and his pupils. Cell and Goku then fight. Goku puts up a good fight, but he steps down from the fight and appoints Gohan to take his place. Cell bats around Gohan with ease, until goes into explaination about his hidden power. Cell is impressed and he decides to unleash Gohan's hidden powers at any cost. Cell creates 7 Cell Jrs to attack the Z Senshi. Android 16 attempts to self destruct to kill Cell, but fails since his bomb was removed. Android 16 explains that Gohan should release his restraints on his hidden power and to let it go. Cell then crushes Android 16's head. This unleashes Gohan's hidden powers, and Gohan goes Super Saiya-jin 2. Gohan then starts defeating Cell. Gohan kills all 7 Cell Jrs. Gohan punches Cell in the gut so hard, that Cell spits out Android 18. Cell knows he can't win so he decides to self-destruct. Goku teleports Cell away to King Kai's planet before he explodes. Cell explodes but survives. One of Cell's particles survived and Cell regenerated from it with his perfect power restored stronger than before. Cell is also able to use the teleportation ability of Goku's. Cell returns to the Earth. As soon as Cell returns, he kills Mirai Trunks. Vegeta becomes enraged and fires an all out assault against Cell. Cell survives and is about to kill Vegeta until Gohan saves Vegeta. However Gohan is wounded. Cell then has a showdown with Gohan in a Kamehameha duel. Cell seems to be winning. Piccolo, Tenshinhan, Yamcha, and Krillin try to stop Cell, but they fail. Goku encourages his son through the grave, but Cell's beam is about to overpower Gohan's until Vegeta fires a ki blast at Cell. Gohan's beam then overpowers Cell's and Cell dies. However Cell tries to take over Hell along with Freezer and the Ginyu Force, but they are stopped by Goku and Paikouhan. Cell and Freezer make another attempt to take over Hell in GT, but they are once again stopped by Goku.